The panel discussion of The Long Depression, the recent book by Michael Roberts, was one of the highlights of this year’s 2016 Historical Materialism conference in London. Michael himself opened the session with a summary of the core arguments of the book, focusing on what he describes as the third great depression in the history of capitalism, triggered but not fundamentally caused by, the financial crisis of 2007-8. Jim Kincaid responded with some of the questions he has already raised on this blog about Michael’s use of data. Al Campbell, the final speaker on the panel, provided some alternative charts, based on his work with Erdogan Bakir, suggesting that the rate of profit in the US economy had been on a rising curve in the period before the financial crisis exploded in 2007. For Al this was a crisis of the neo-liberal regime which emerged in response to the crisis of profitability of the 1970s and early 1980s, but it could not be a function of a recent fall in the US rate of profit as that is not supported by the evidence. In this ‘guest blog’ I am not going to engage with the data, not least because I share Jim Kincaid’s skepticism about the reliance on US national income accounts as a source for corporate profitability – whilst acknowledging that there is no adequate alternative available for those engaged in empirical investigation. Instead I want to step back a little from the immediacies of that argument and consider the theoretical framework of Roberts’ book. Critically, I want to question the assumption that reliance on Marx’s analysis of the tendency of the rate of profit to fall, and the counter-tendencies to that process over the long-term, is sufficient for an explanation of the cyclical fluctuations which have characterised capitalism since the early 19th century. Please note that I am not denying the logical coherence or the relevance of Marx’s Volume 3 analysis of tendency and counter-tendency to analyzing the whole period since the 1960s. I am challenging what I consider to be over-reductionist and two-dimensional applications of Marxist theory to the latest phase of global crises. In my own paper for the HM conference which Michael Roberts mentions in passing in his recent blog “Transformation and Realisation – No Problem”, I began by recommending Richard B. Day’s book The Crisis and the Crash (published by Verso back in 1981) which surveys the debates in the USSR in the 1920s and 30s over Marxist analysis of Western capitalism in that epoch. Two debates are highlighted. The first focused on Kondratiev’s theory of long-waves and featured Trotsky’s critical response of 1923. The second on Day’s account derived from the respective legacies of Hilferding and Rosa Luxemburg and came to a head in the late 1920s as a cyclical upturn in Western capitalism reached its limit with the Wall Street crash. On the one side were those, such as Maksakovsky (who died at an early age in 1928) and Preobrazhensky, for whom imbalances between departments of reproduction (of which more below) were critical to explaining cyclical fluctuations and who are now categorized as ‘disproportionality’ theorists. On the other side, which eventually prevailed as Stalinist orthodoxy, were those led by Varga, who emphasized the limited consumption of the masses and can be labelled as ‘underconsumptionist’. One significant difference was that the former school consistently located crises as only one phase in a cyclical process which could change in character and amplitude (as Preobazhensky emphasized in his 1931 book The Decline of Capitalism, translated into English by Richard B. Day himself) but would not disappear as long as capitalism survived. The Varga school by comparison, especially in the 1930s, was stagnationist, denying the very possibility of any sustained recovery of capitalism. Marx’s tendency for the rate of profit to fall, as a function of a rising organic composition of capital, plays no role at all in these debates. The rate of profit features as a variable, especially for Maksakovsky, but the determinants of fluctuations in profitability over the cycle are rather different. The disproportionality theorists focused on Volume 2 of Marx’s Capital and in the Russian debates this emphasis derived from Lenin’s debates with the Narodniks (who denied the possibility of capitalist development in Russia) in the 1890s. They certainly did not rely, as Michael Roberts mistakenly suggests in his blog comment, on another Russian theorist, who also criticized the Narodniks for underconsumptionism, the notorious ‘harmonist’ Tugan-Baranovsky. What’s curious about contemporary Marxist debates, stretching back to the first serious crisis of the postwar period in the mid 1970s, is that we have a comparable polarization but now its the ‘disproportionality’ theories that have disappeared from view. Although this is to oversimplify a many-sided debate, the dominant currents evident in Marxist writing on the crisis of 2007-8 are both two-dimensional. On the one hand, there are those such as Michael Roberts, and Robert Brenner, who despite certain differences, emphasise a long-term decline in the rate of profit since the late 1960s combined with a financial system characterized by excessive debt levels. On the other there are those such as the Monthly Review current of Foster and Magdoff, and for the 2007-8 crisis at least, Dumenil and Levy, who emphasise growing inequality, with underconsumption accompanied by excessive levels of debt. Michael Roberts is quite correct to note the similarities of the latter position with that of certain left Keynesians such as Joseph Stiglitz. He is incorrect in his frequent suggestion that his own approach is the only other viable Marxist theoretical framework available. I’ve omitted some of the options on the right hand side of the original chart (indicated by the …) in order to highlight the critical binaries from a Marxist perspective. Michael obviously wants readers to follow him down the left hand side of the chart with a YES, YES, YES, YES . But I’ve added in three question-marks to register my objection to the choices as presented in the chart. The first (?) arises in response to the second question and its reference to a kernel of crisis. What this fails to register is that capitalism as a system is a contradictory unity of both production and circulation. Production of value and surplus-value is primary but the process of circulation is still necessary to the ‘realisation’ of value, with the sale of commodities in the market. Volume 1 of Capital comes first with its detailed exploration of the capitalist production/labour process which, Michael correctly observes, is ignored in the Keynesian/Kaleckian tradition. But the widely neglected, comparatively arid, Volume 2 of Capital which focuses on the circuit of capital through its different phases (M…C…P…C…M´) is essential to understanding Marx’s analysis of the cyclical fluctuations of the system. All the participants in the Soviet debates summarized by Richard B Day understood that. In recent debates, by contrast, David Harvey and Ernest Mandel (not least in his introductions to the Penguin volumes of Capital ) are exceptional in their attention to Volume 2. For Michael Roberts, David Harvey can be dismissed as just another underconsumptionist. My second smaller (?) on the chart puts in question that labelling of both Harvey and Rosa Luxemburg. Leaving Luxemburg to one side, I simply recommend Harvey’s A Companion to Marx’s Capital Volume 2 as a corrective to that oversimplistic reading and as a more innovative text than the title might suggest. I disagree with Harvey’s critique of Marx’s ordering of the texts of Capital and his interpretation of Marx’s dialectical method. Harvey is certainly wrong, for example, to suggest that Marx assumed ‘perfect competition’ ( a theoretical construction of neoclassical economics which postdates Marx) in Volume 1, and would benefit from reading up on the theory of ‘real competition’ in Anwar Shaikh’s recent magnum opus Capitalism. But that raises another set of issues I cannot address here. What matters in this context is Harvey’s vital emphasis on capital as always in motion, across time and space. But this process through the phases of the circuit can be blocked at any point and even a slowdown in the process of circulation can precipitate a crisis. This in turn enables Harvey to locate the centrality of the credit system and banking to overcoming these blockages – and justifies his inclusion of a lengthy section on credit and the banking system in Volume 3 of Capital in a commentary on Volume 2. My third (?) 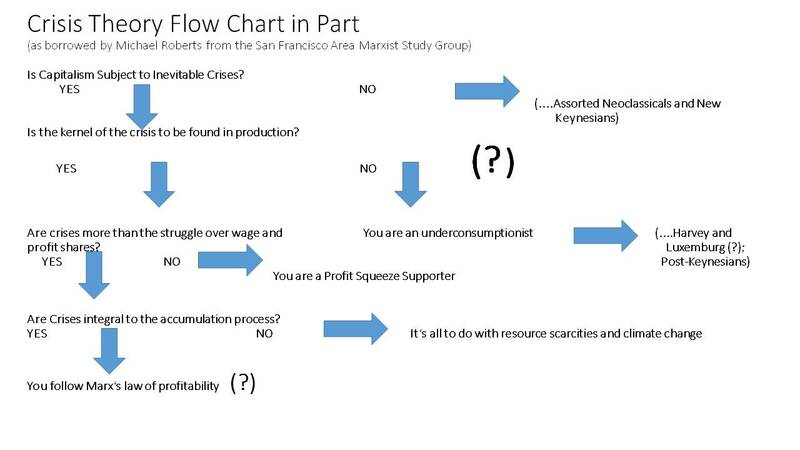 on the chart refers to “Marx’ law of profitability” as a response to the question “Are crises integral to the accumulation process?”. For any Marxist the question obviously demands an affirmative response. But there are at least three further questions that need to be posed. Firstly, the accumulation process as I’ve just suggested embraces the whole circuit of capital. It requires the concentration of money capital and the availability for purchase of the necessary means of production and labour-power. Nor, rather obviously, does investment in production guarantee success in the market-place. Secondly the so-called law is actually a law of a ‘tendency’ subject to counter-tendencies, and I would argue that these unfold over a longer time-period, and thus have a different temporality, to the regular business cycle which lasts from 7 to 10 years and is sometimes known as the Juglar cycle. Thirdly, the actual rate of profit received by individual capitals is subject to a variety of determinants, including the level of effective demand, and these can fluctuate over the cycle as a result of factors which are not directly a result of changes on the organic composition of capital but will influence expectations of future profitability. “It is a pure tautology to say that crises are provoked by a lack of effective demand or effective consumption”. But for Marx this sentence is prefatory to a critique of the ‘underconsumptionists’ of his time who argued that raising wages would somehow “avert the crisis”. Marx’s objective at this point is to show how a balance of demand between Departments 1 and 2 is possible and the system can therefore reproduce itself. But as he goes on to indicate the conditions for equilibrium between the two departments are such that systemic disproportionalities will inevitably arise which may only be rectified by “ a major crash” (p596). Michael is of course right to say that changes in aggregate levels of investment and employment are critical factors determining changes in levels of aggregate demand. Keynes himself would have agreed. However, there appears to be one error here and a significant omission. The error lies in the conflation of overproduction and underconsumption as ‘two sides of the same coin’, when underconsumption is equated with a lack of consumer spending by workers. For Marx overproduction normally arises, in the first instance, in what he calls Department 1, producing means of production, including both machinery and raw materials. The problem is a relative lack of ‘productive consumption’ as Marx sometimes describes it. The fall in demand, or more commonly a slowdown in expansion of demand relative to an expansion of capacity in Department 1, stems from other capitals in both Departments whose capacity has also grown too fast relative to demand. The omission relates to the relationship between the lifetime of fixed capital and the temporality of the cycle, which is curious because Michael Roberts does mention this at one point in his book on page 220 in the chapter on cycles. Yet it fails to play any role in the earlier analysis. This is where a careful reading of Pavel Maksakovsky’s The Capitalist Cycle (originally published posthumously in 1928, translated into English by Richard Day and published in the HM book series by Brill in 2004) would be helpful. This book reveals someone with a sophisticated grasp of Marx’s method and there are some fascinating passages in the opening chapter on the process of abstraction in Marx’s work. But the core of the book concerns, as the title suggests, the regular business or Juglar cycle and Maksakovsky offers only a cursory dismissal of Kondratiev’s long waves, which is regrettable. That said, the author proceeds from Marx’s emphasis on fixed capital formation as critical to explaining the cycle. Maksakovsky moves beyond Marx, however, by dropping the assumption which Marx retains in his analysis of the relationship between Departments 1 and 2, namely that market prices always correspond to values (or indeed to the prices of production introduced in Volume 3). As Maksakovsky shows, starting from the ‘depression phase’ of the cycle, demand for investment goods will revive with the need for replacement of existing fixed capital which is worn out or has become obsolescent with technical change. If the available capacity in Department 1 has been reduced during the previous crisis with the shutdown of mines, oil wells or steel plants etc., the revival in demand will tend to raise prices above values in those sectors. Whilst the supply of such products takes time to come on stream, employment increases immediately generating an expansion of demand for consumer products. Profits will tend to rise with rising prices encouraging even more expansion in both Departments. But towards the peak of the expansion phase the new investment begins to result in extra supply being thrown into the circulation process. Now just a slowdown in demand for additional machinery from Department 2 will generate excess capacity in Department 1 (here Maksakovsky anticipates the accelerator of Keynesian business-cycle theory without the rigid formalism). Prices and profits will fall and the process goes into reverse. The law of value begins to prevail (i.e. relative prices fall to the new lower values set by socially-necessary labour-time) but only after a “prolonged interval of time”. The cyclical fluctuations Maksakovsky suggests will occur independently of what happens in the world of finance and are driven by changes in investment, as the evidence stressed by Michael Roberts confirms and which is not in dispute. But only when the overaccumulation of capital is fuelled by an overextension of the credit mechanism and fictitious capital does the turning-point from boom to depression take the form of a crisis or a financial crash. The previous two paragraphs provide only a brief sketch of a sophisticated but highly abstract analysis of the cyclical pattern which has characterized capitalism since the early 19th century when fixed capital became a significant component of the production process. Preobrazhensky in his Decline of Capitalism of 1931 develops this type of analysis more concretely in the context of the post-crash depression. He stresses the impact of monopolization and international cartels and the creation of excess reserves of fixed capital in the 1920s, making the recovery from the crisis after 1929 much slower than in the classic cycle of earlier periods. Comparable work is needed on the changing cyclical patterns of recent decades. But it is not difficult to extend the analysis to, for example, the patterns of overinvestment in the telecommunications/IT sector in the late 1990s, or in the oil and mining sectors globally in the second half of the 2000s. That last example should also remind us of the need to consider the uneven and combined development of the system globally and the global imbalances emphasized by astute mainstream commentators such as Martin Wolf. A fully-developed multi-dimensional theory of crisis also needs to take into account the uneven capacities of nation-states for intervention and the impact of class struggle, including the sustained drive of international capital to raise rates of exploitation through outsourcing and global restructuring. But what of the longer-term tendency of the rate of profit to fall as a function of the rise in the organic composition of capital (the ratio of dead to living labour in the system)? Unlike some critics I am not rejecting the relevance of this or the equally significant role of counter-tendencies raising profitability over the long-term. Indeed I would endorse to a degree Michael’s emphasis on longer waves in profitability (pp225-6 of his book) but link them more closely to Kondratiev waves (which is how I interpret Shaikh’s sketchy remarks on this question at the end of his book). But these longer waves, which underlie the 7 to 10 year Juglar business cycle, lack the regularity imputed to them by Michael. What can be shown in my view is that when the underlying rate of profit is falling the business cycle fluctuations are more severe as is evident from the late 1960s to the early 1980s, and when the underlying rate is rising, the amplitude or the severity of recessions is reduced as in the 1990s and early 2000s. What’s new in the 2000s however is the unprecedented rise in the share of financial profits in total corporate profits as Lapavitsas and Mendieta-Munoz explore in a recent article in Monthly Review (July-August 2016). But that is yet another story. One final point. Michael is fond of suggesting that to say crises are a result of a lack of effective demand is like saying the weather is wet because it’s raining. What I’m suggesting here is that to claim crises like those of 2007-8 are a result of a long-term tendency of the rate of profit to fall is like saying storms and hurricanes are simply a result of global warming – there are a lot of mediations or causal links missing from the analysis, even if the data on the underlying trend confirm the thesis, which on the plane of global capitalism is much more questionable than for climate change.